Disfrute de una inmersión profunda en dos de las ciudades costeras más históricas de Nueva Inglaterra, Plymouth y Newport, durante esta excursión de día completo. Viaje de regreso a los primeros días de la historia de los Estados Unidos y de los peregrinos mientras visita Plymouth Rock, eche un vistazo a Plymouth Plantation y descubra la recreación de un pueblo inglés del siglo XVII. Luego continúe hacia las cercanías de Newport, Rhode Island, hogar de una élite estadounidense, para explorar la opulenta mansión Breakers Mansion. El transporte compartido ida y vuelta desde Boston está incluido. Sigue el camino de los peregrinos mientras exploras Plymouth, el hogar de su colonia del siglo XVII. Vea el Plymouth II, una réplica del famoso velero de los peregrinos. Partida de Boston o Quincy por la mañana, continuando en transporte compartido hasta su primera parada en Plymouth, Massachusetts. Este pueblo costero histórico es famoso por su vinculación con los Peregrinos, que fundaron una de las primeras colonias europeas de los continentes en el siglo XVII. Admira la encantadora arquitectura del pueblo de pescadores y pescadores del siglo XVII de Plymouth, y haz una parada en Plimouth Grist Mill, una fábrica de molienda de maíz de agua que data de 1636. También tendrás tiempo para visitar el famoso Plymouth Rock y ver el Mayflower II, una reproducción a escala real del histórico velero Pilgrim que trajo a los Peregrinos a América en 1620. 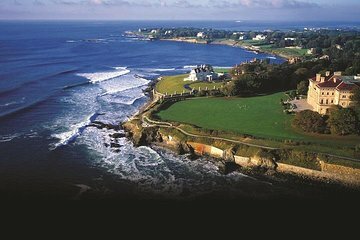 Continúe el día cruzando la frontera hacia la cercana Rhode Island mientras se dirige al histórico Newport para visitar la mansión Breakers. Esta lujosa propiedad ofrece un gran ejemplo de las casas extravagantes construidas por familias adineradas como los Vanderbilts a fines del siglo XIX. Explore el gran salón central de la mansión, de 45 pies (13 metros) de altura, y su hermoso diseño interior de influencia francesa e italiana, gran parte del cual fue creado y ensamblado en Europa antes de ser enviado a los Estados Unidos. Al finalizar su visita a Newport, regresará a su punto de partida en Quincy o Boston para finalizar el día. The Plimouth village was very run-down and scruffy, not in an 'original' way the Puritans would have been very diligent to keep their places clean but in careless neglect, weeds, decay. Disappointing waste of good potential! Our tour guide didn't speak English so he was silent the whole trip. Only time he talked was when he wanted money. We didn't know we had to pay him for the tours and he picked a Chinese Banquet in an old shopping center. We decided to go next door and have a cheaper lunch, than the one he took us to. We had to ask where we were during the whole trip! This tour is run by Sunshine tours a Chinese owned company. There is no guide but a driver who speaks Chinese/American, but rarely says anything. We paid for our ticket but just as well we had extra cash as the ticket did not include entrance to Breakers Mansion or Plimouth Plantation and Grist Mill. Lunch was not included in price and choices were KFC, McDonalds which none of us wanted so driver took us to Chinese restaurant where we had a very enjoyable, plentiful buffet. Back in the car to be dropped at a Plymouth Rock and a walk around. We couldn't see Plymouth 11 ship as it was being refurbished. We didn't realise there was so much driving around as driver never conversed with us. Sights were good but should be better planned. Today we expect more for our money. Unless they improve this tour don't waste your money. I was not impressed with this tour. First I was told three different times to meet and the meetup place is outside a restaurant which is not made clear in any prior communication. I expected it to just be basically a bus ride with maybe a bit of additional information and then an opportunity to explore different places either pay for the main attractions or just check out the town. It was just a bus ride with no additional information and they take you to a mansion and the the plantation and they literally your only option because they are so far away from everything else so it's about 75 more dollars but you have to pay the tour guide in cash. If you aren't going to give people options then just include the price upfront. Our tour guide was nice but he was texting and driving the entire drive there and on the way back he set up his phone on the dashboard and was watching a movie! It was shocking! He also smoked so the van smelled, which didn't really bother me but I think is important to note. Overall, I highly recommend avoiding this tour and just taking a bus or renting a car if you want to go to any of these places. It was ok, but not great. I was a little disappointed that this was the way I introduced my parents to the Breakers. It states on the add that the guests are responsible for the ticket fees to get into the sights and the cost of food. I was completely expecting that. What I was not expecting was to have the tour bus driver explain that we are also going to the Grist Mill in Plymouth an addition 7 per person, the Plymouth Rock and a Chinese sushi/BBQ buffet for lunch an additional 15 per person and that every guest had to pay him 83 in cash to cover the cost of all these things. He then put out his hand and said I owed him 332 in cash for my group. I explained that I didn't have cash with me, I was planning on using my credit card to pay for the tickets when we got to the site. He said that was not how it worked, and then pulled the entire bus over to a bank so I could go to an ATM, I explained I didn't have an ATM card with me, I had a credit card. He said I could do a cash withdrawal from the ATM with my credit card. It's certainly not how I would have wanted to do things, but they entire bus was waiting on us and it made it really awkward for my parents, so my husband and I just did it. When we got to the Breakers we had 1 hour, which was not nearly enough time to get through the whole thing. Then we went to the Chinese Buffet for lunch. We had 1 person with a seafood allergy in our party me and they couldn't guarantee no cross contamination. My mother doesn't eat at buffets or anyplace that employs a sneeze guard - she is admittedly a germafobe. There were apparently no other options so for 60 for lunch, only 2 of us actually got to eat a meal. The tour guide asked what we had expected, I told him we had expected to be able to stop and pick up lunch at one of the sites. Nothing more. We got to Plymouth Plantation and had just over an hour, so we didn't get to see the whole thing. It had started to rain which slowed things up no one's fault obviously but then the Grist Mill was closing, so we were given 5 minutes in there and then had to leave. Not really worth having left the Plantation without having been able to see the whole thing for. Certainly not worth the money. I had high hopes for this trip. Maybe too high. I thought we were going down to the Breakers for the morning, to the Plantation for the afternoon and then home. The tour guide was very nice, but that was totally not what I got. Instead we spent the day saying, Well, we can always plan another trip on our own to come back and see this. A more detailed itinerary or break down of expectation of costs and payment methods if they are going to be so specific as to cash paid to driver and include more than what is actually included in the tour would be helpful! Really just a bus trip. Enjoyed the foreshore of Newport while most visited the Breakers mansion. Also enjoyed the history of the Plymouth visits but thought it was quite expensive for what you got. I was very disappointed with my trip because my guide spoke very little english and we could not communicate. The man was very nice and did his best but when I asked if we would see the Mayflower he said today not open when we arrived at Plymouth rock there was no Mayflower in sight. He also collected a 9.00 gratuity from everyone and I thought the gratuity was included not sure The cost of the trip covered a driver who took us from one place to the next and gave no explanation about anything. Entrance fees, gratuity and lunch cost me another 76 over and above the cost of the trip. To be fair, I took a Viator trolley tour in DC which was great and I would recommend it - this trip was not very good at all. Nice day. The only negative was that the tour was mostly done in Chinese. Signed up for tour through Viator, but they sell it / outsource it to a group called Sunshine. My 76 year old mom and I thought it was odd that we were picked up in Chinatown and then even more odd that everyone else on the tour spoke only Chinese. The tour guide was very sweet and he translated a lot of what he said into English for us. The tour guide was excellent. He was very thorough in his explanations. I enjoyed it very much. É um passeio bem histórico, mas interessante.